Small businesses are the backbone of America. According to the Small Business Entrepreneurship Council (SBE) and 2014 US census data, businesses with less than 20 employees made up 89.4% of all American business. When non-employer or sole-proprietor businesses were added to the group, the percentage hit 97.4. If you identify as a small business, you know that technology issues for a new start-up or growing business differ greatly from a large corporation. The technology you need to keep your small business running smoothly, the need to utilize cost-effective tools and the process of selecting the right technology for your business are all unique for small businesses. Another factor for US small businesses is the emergence of the Millennial generation in the workforce. The Millennial mentality is to consider the quality of life and place as important as job satisfaction. Many feel that more rural areas provide a better environment for raising children and that working where you live as opposed to living where you work is a priority. 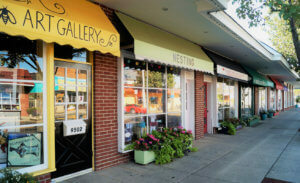 The combination of socio-economic strife in rural America and the trend of entrepreneurial Millennials locating to rural areas is a perfect recipe for the growth of small businesses in rural America. Don’t forget that today’s small businesses are not the ‘mom and pops’ of the past. They need to compete in the global, digital economy, and the digitally native Millennials would have it no other way. Learn about the best tools for your small business. Embrace Technology: Don’t let yourself be intimidated by the technological era. Using technology can help your company grow faster and stronger. Employ the Cloud: The cloud will store all the information you need it to so that it is accessible from anywhere, safe no matter what, and frees up room on your servers. Don’t Underestimate Email: Though email may seem like a chore at times, 3.7 billion people use email worldwide. It is a vital part of marketing in the modern era. It’s also very cost effective and should not be ignored by your business. Be Mobile: 83% of today’s employees work remotely. Enabling your business to do the same will save you time, money and will attract the best employees in your field. Don’t Skimp on Conference Tools: You really can’t operate a successful business without meetings. Today’s conference tools make running a meeting from your living room just as easy as running one from the conference room. 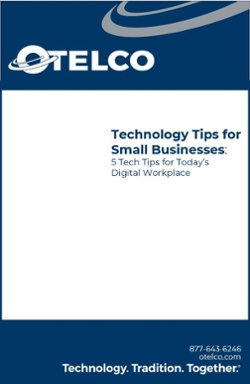 These five tech tips are a great way to dip your toe into the world of business technology. Whether you are a current small business owner or looking into starting your first small business, these tips are a great place to get started. So let us expand on them, to give you an idea of what a small business needs to succeed in the technological era. Years ago, if you started a business, you didn’t need technology tips, you needed money; you rented space, bought some desks and file cabinets, a couple of phones, a fax machine, a copier, a couple of PCs and a printer. You communicated by phone and email. If you needed to fax a document, you likely printed it, signed it and then put it on the fax machine. What you had was lots of paper and lots of independently operating equipment. How Do Small Businesses Keep Up? Keeping up with emerging technology can be a full-time job. Hardware, computers, servers, and phones are constantly advancing. Many software applications seem to need weekly updates. As software becomes more sophisticated, the hardware that houses and runs it needs to follow suit or the software won’t operate properly. That is why many small businesses, and even some larger businesses, choose to outsource their IT department. Outsourcing your IT department is great because you can still get the assistance you and your employees need, without having to spend the money on a full time IT personnel. Another outsourcing bonus is that you can use this as an opportunity to support another small business, as IT consulting is becoming one of the fastest growing small businesses. Cloud computing is taking over the tech world. In today’s technology driven world you hear about “the Cloud” constantly. 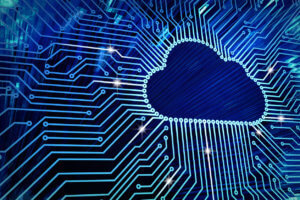 The cloud, or cloud computing, is the practice of using a network of remote servers hosted on the Internet to store, manage, and process data, rather than a local server or a personal computer. Working with the cloud is great for small businesses because it allows you to save space in your network, access your work from anywhere and keep your ensure your data is safe. 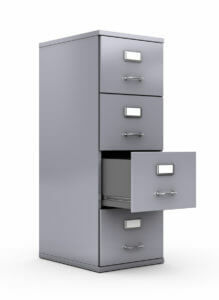 BaaS is a way to safely store all of your companies digital data, by backing it up to remote servers. 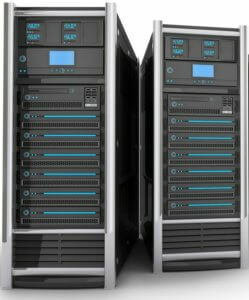 These servers are located in offsite data centers that are climate controlled, with alternate power supplies and 24/7/365 system monitoring. At this point, every business owner should be backing up their company’s data. Between natural disasters, cybercrime, and human error it is almost guaranteed that at one point or another your businesses digital infrastructure will be compromised. When that happens, every second you can’t access your data will cost you. 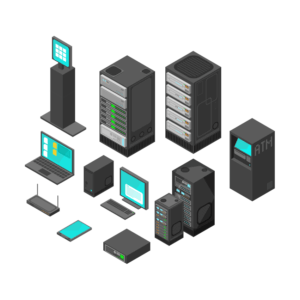 With BaaS, you will have an efficient and secure way to restore your data. Saving you money, time and peace of mind. SaaS is a software distribution model in which a third-party provider hosts applications and makes them available to customers over the Internet. Today, most major software companies are transitioning to the SaaS. In fact, it is more than likely that you are already using a SaaS tool. Cloud faxing is another nifty SaaS tool. SaaS faxing solutions, such as Classifax, allow you to send and receive faxes over the Internet. SFax is another great faxing solution, designed for businesses that need to be HIPPA compliant. Some other popular SaaS products are QuickBooks, Paylocity, and Salesforce. IaaS provides access to computing resources in a cloud-based environment. IaaS allows you to work off of a virtual infrastructure that is located on the cloud and accessed through the web. You can store data, download software, and work off the virtual desktop just as you would local infrastructure. IaaS is a great tool for companies with telecommuters or “bring your own device” policies because it offers a secure platform that can be accessed on any Internet connected device. It also a great tool for companies with lots of sensitive data. For example, medical offices and healthcare analytics companies will often use specialized Virtual Desktop software to better meet strict HIPPA guidelines. PaaS is a service delivery model that allows a customer to rent virtualized servers and associated services used to run existing applications, or to design, develop, test, deploy and host applications. Most PaaS tools are geared to software development and are largely unnecessary to other small businesses. PaaS solutions provide compute and storage infrastructure, text editing, version management, compile and testing services. These tools are great because they all developer to focus on their product, without having to worry about maintaining their infrastructure. Whether we like it or not, email is a big part of daily life. Business Email: Love it. Hate it. But we can’t live without it. It also tends to pile up and get ahead of you: that’s the hate part. 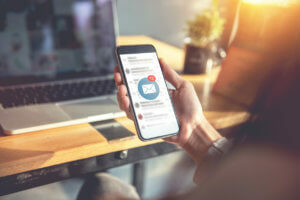 Aside from the obvious day to day business communication, your email system can be an extremely valuable internal and external marketing tool for your small business. 80% of professionals say email is a great way to market to your clients. Experts evens ay it is more important than Facebook. We’re not talking those spammy ‘buy my product’ emails; a simple periodic newsletter that’s fun and interesting can be even more effective than other direct marketing methods. Sure you can talk about your products and services, but why not share interesting stories about your other clients and how they make the most of your products and services. Short case studies are interesting and will help your sales team. Get personal: A great way to connect and develop a rapport with your customers and prospects is to find common interests. Consider sharing interesting stories about your staff. New hires always make for good content, but don’t overlook unique and interesting things that your team does outside of work. Highlighting the community or civic involvement and charity work of your staff creates connections, stories about interesting hobbies can also help prospects feel more acquainted with your company. Maybe your CEO is building an airplane in his basement, or you may have a sales rep that is an amateur harness racer, perhaps there are foodies among you, so why not share a recipe now and then? The point is to let your customers see the human side of you and your team. Have some fun: Share an obscure fact about something or someone related to your industry, or insert a funny meme that relates to your small business. Give the reader something fun or silly to look forward to. Though take note: It is important to give your customers and prospects a way to opt out of these emails (there are always a few who will have that ‘hate’ relationship with email). It can be as simple as responding with “unsubscribe” in the subject line. However, if your emails are fun and entertaining, you likely won’t see many ‘unsubscribes’. In this digital age, we’re spending less time on the golf course and more time connecting in other ways. A simple quarterly business email newsletter can help establish new, and nurture existing relationships and keep your product and service offerings fresh in the minds of your customers and prospects. In a small office this is pretty simple, but when your small business grows, it could be more of a challenge. Why not plan for that growth and facilitate growth at the same time. The most recent thinking about the best way to grow your small business is to engage your employees. What that means is to foster an emotional commitment from your staff toward your organization and its goals. Studies show that engaged employees work harder and provide better customer care, which builds better customer loyalty. That equates to a better bottom line. A monthly email newsletter to your staff is one of the best ways to engage them. Similar to customers and prospects, although perhaps more casually, you can share new product information and other company initiatives, introduce new hires, highlight staff or company involvement in community events, and share recognition for staff accomplishments. A regular newsletter can also be a conduit to get valuable feedback from staff through quick surveys. The bottom line here is that using internal email to engage your staff is as important as using a business email newsletter to stay in touch with your clients. Focus on home and work simultaneously. Is there nothing more damaging to productivity than a workplace distraction? (Okay, maybe taking ten minutes to talk to coworkers about the latest episode of Game of Thrones isn’t the worst thing in the world.) However, when running a small business, we all know how the old saying goes: time is money. With business seemingly booming and not enough time in the day to accomplish everything on the to-do list, every hour during the workday is precious. So be mobile, and take your business with you! Maybe you’ve found yourself here: You’re en route to meet with a potential client, but because that old office phone system only allows you to listen to voicemails when tethered to your desk, you never received the message that the meeting was moved from the coffee shop to the restaurant on the other side of town. So not only are you late for the meeting, but you’ve lost all of that precious time driving across the city — obviously bad for productivity. A cloud-based phone system, such as a Managed Hosted PBX system lets businesses streamline office communications with a system rich in features. Access your office from your smartphone, wherever you are. With Hosted PBX, users have the ability to selectively forward calls from an office phone to a cell phone, allowing you to take your office phone on the go. A secure web portal augments basic phone functionality and allows users to control and configure their PBX phones to suit your individual needs, meaning it goes wherever you need it to go. Not only is this good for productivity, it offers your clients the continuity of reaching you regardless of your location. For small businesses with three or more phones, let alone three or more locations, streamlining office communications is a huge time-saver. Working beyond walls can be a boon for productivity, but what about inside the office? Today, it’s hard for a small business in its infancy to drum up the resources needed to hire someone dedicated to answering the phones. Hosted PBX’s integrated auto attendant feature answers calls for you and direct your callers where they need to go when you don’t have staff available to answer calls. The system can also be programmed and scheduled to greet callers with customized messages, including holiday closings, inclement weather notices and virtually any message you would like customers to hear when they call in. 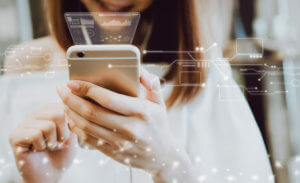 These features, coupled with reliable call forwarding can make your productivity issues a thing of the past for your small business. Millennials receive a lot of criticism, but the fact remains that they make up about half of America’s workforce. It isn’t all bad though, these young people do have a lot to offer. They are very innovative, technology savvy, and actually quite motivated to be successful. Like anyone, it is all a matter of working with these young folks and the easiest way to do that is to give them the freedom to work from home. With Hosted PBX you can give all of your employees the freedom to do their best work, from wherever they want. Want to know more about Hosted Phone Systems? We have a guide for that! 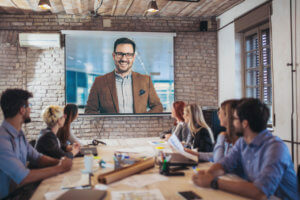 Video conferencing can connect you to co-workers and business partners around the world. Facetime is important. Nearly 100% percent of people agreed that face to face meetings are an essential part of doing business. Unfortunately, it isn’t always possible to be in person at every meeting. When that happens, video conferencing is the next best thing. Whether you need to conference someone into a meeting or meet with several people at once through video, there are so many great apps to choose. There are several other perks to video conferencing, such as screen-sharing, adding landline callers, and the ability to record and save your meetings. File sharing is a great way to make sure that everyone in your meeting is literately on the same page. If you are leading the meeting with a slide show, give everyone in the room the option to view the slides on their own computer. Create an editable document that your co-workers can collaborate on at the same time, instead of emailing edits back and forth. Sharing information has never been simpler! Video contact isn’t always possible when this happens phone conferences are another great way to hold a meeting. Most video conferencing apps have the options of audio only. We can’t always be in front of a computer though, and in those cases, phone conferencing is a great tool for your small business. Hosted phones make audio conferencing simple and convenient. Join in on a phone conference from anywhere, as easily as if you were in the office. Forward all your calls to your cell phone, so that you can conference on the go. Use Office365 ingratiation to find the contact information for everyone in your Network, and to conveniently schedule your calls. Place your phone on Do Not Disturb, to prevent unwanted interruptions, and choose specific people who can join the call. • Mobile Friendly • Cannot remove someone from the chat. • Users need a Google+ account to join. Zoom • Can add people via phone call. • Remote Screen Control • Best features require purchase. • Very user-friendly • Requires an office 365 account. Unified Communications could easily fit under any of these tips. UC is the “unification” of all your businesses “communication” platforms. E-mail, IM, Video Conferencing, Phone, and more all neatly packaged together. Effortlessly switch between the apps and devices with your Unified Communications Client. The UC Client is the platform your small business chooses to use. Through the UC Client, all of your employees can conduct business separately, while still outwardly being seen as a single corporate identity and number. • Determine the technology needs that may be unique to your business. • Find the most cost-effective solutions. • Assess your ability to manage those solutions. • If necessary, contract for the services you can’t or don’t want to manage.